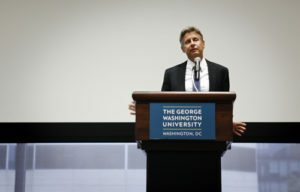 Former presidential candidate Gary Johnson called on the government to end federal student loans, one of the many Libertarian views he advocated for in a talk with supporters Monday. Johnson, the former governor of New Mexico, ran in the 2012 presidential election on the Libertarian Party ticket, winning nearly 1.3 million votes and outpacing all the other third-party candidates combined. The 60-year-old said “guaranteed” student loans from the federal government encourage colleges to raise tuition costs, spiraling young people into debt. A graduate of the University of New Mexico, Johnson said he worked as a handyman to help pay his way through school. He founded his own business, Big J Enterprises, after graduation and entered politics in 1994. A bicyclist and mountain climber, Johnson told the packed room that the end of his 2012 presidential campaign was “like being released from prison.” He later said he believed the majority of Americans are fiscally conservative and socially liberal like him, but his campaign’s lack of funding lead to his downfall. “I really thought I was the most qualified person running for the president of the United States,” he said responding to a question from the audience. But he added that he would “abhor the idea of being a senator,” and that he had “no thoughts” on running for the Oval Office in 2016. Johnson championed the end of corporate and income taxes in favor of a “fair tax,” an all-encompassing national consumption tax. He also advocated for immigration reform, the abolishment of the U.S. Department of Education and decriminalization of marijuana. “I don’t give a crap on how you live your life as long as your life doesn’t adversely affect mine,” he said, prompting applause. The speech was the last stop on Johnson’s month-long “Live Free” tour of campuses nationwide.